Who doesn’t love a New Orleans Second Line? New Orleans Second Line: A Little History and A Lot of Fun! 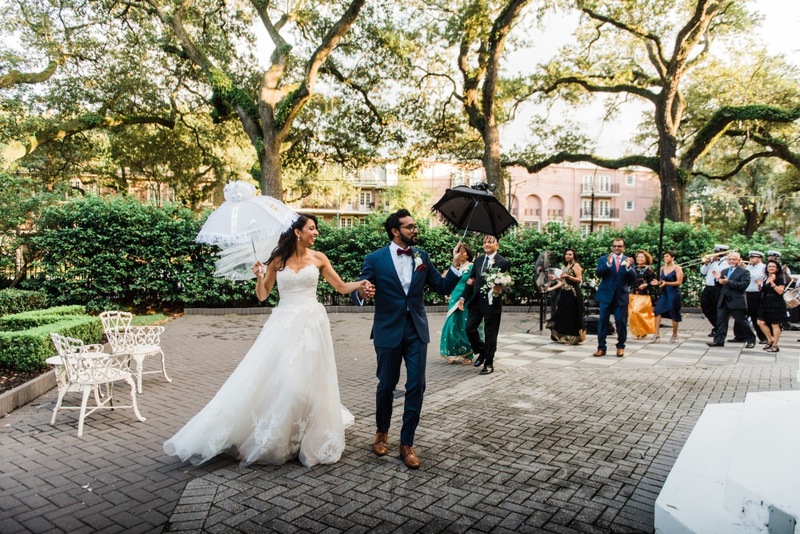 If you are searching for a fun way to have you and your guests participate in a little New Orleans culture on your big day, then look no further than a traditional second line parade! Historically, second lines were hosted by neighborhood associations in the African American community. 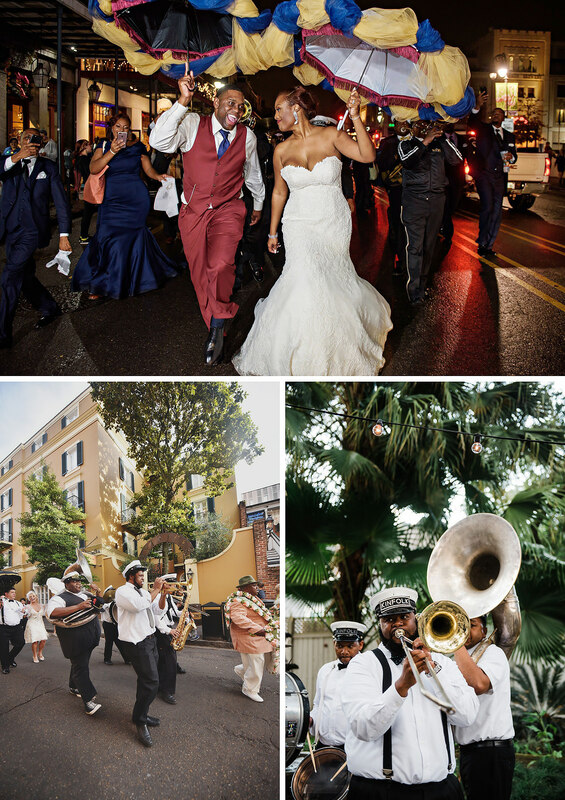 Groups would follow the main parade or procession hence being dubbed the name “second line.” Live brass bands including tubas, trumpets, trombones and a drum typically lead the way as this party moves down the one-way streets of this charming old city. Crowd participation in these events is not mandatory, but both welcome and encouraged to really show the true nature and inclusiveness that the parade is meant to honor. You can still catch the more traditional versions of a second line in local areas on various Sunday’s throughout the year. However, second lines now take place during a large variety of occasions such as funerals, weddings and Saint’s games just to name a few! If you are planning on having a second line in the streets of this beautiful city you do need to apply for a permit and hire yourself a brass band! Permits can be acquired through the City of New Orleans using the following link:https://www.nola.gov/onestop/events/parades/parade-race-permit/ As for bands, there is not a shortage of those to chose from here in this musically inclined city. These groups can be hired to play for about 20-30 minutes either inside your venue or to walk you from one venue to the next. Some brass band groups include not only the instrumental portion but also work with the feather-adorned Mardi Gras Indians to add an extra bit of culture to your parade! So what are you waiting for?! Grab your personally adorned umbrellas and meet me on the streets of New Orleans. You will also need to hire police escorts to clear the road and keep you and your guests safe while parading. The escorts will clear traffic so you don’t get caught up. And don’t forget you need to hire the actual jazz band to play and lead you through the streets. Some bands even get the permit and organize the escorts for you. They can also discuss with you different parade routes to take. I recommend hiring pedicabs for the elderly or people who may have a hard time walking and keeping up. Then they can sit back, relax and enjoy the parade with everyone else. Not all second lines take places on the streets of New Orleans. You can hire a jazz band to come into your reception and parade you around the inside of the ballroom. No need for a permit or police escorts here! 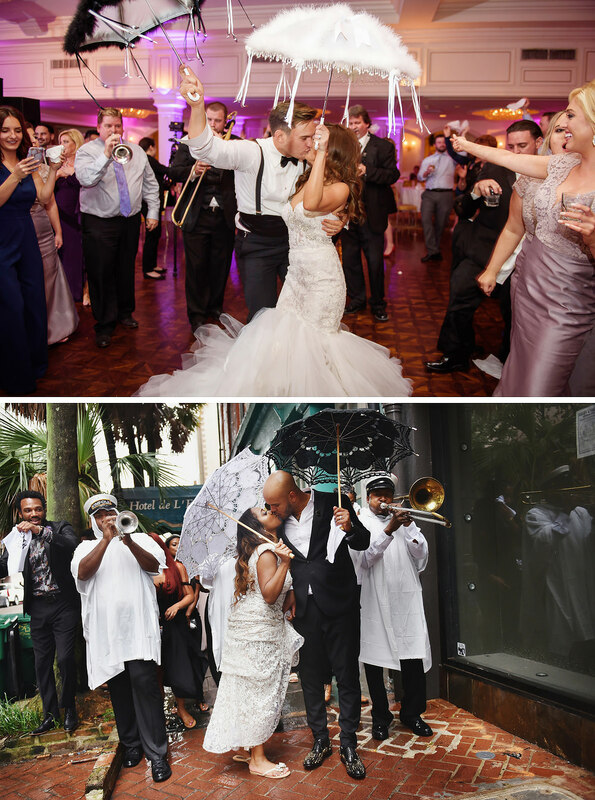 Some of our brides and grooms have the regular band or DJ play traditional second line music and lead the guests around the venue themselves. So why should you have a second line on your big day? They can be used as a fun and involved way to get from one location to the next if your ceremony and reception venue are close in proximity! They have limos everywhere else, but umbrellas and brass bands are only here in the Big Easy. This is especially convenient if your wedding is taking place downtown. Perfect examples include parading from the Saint Louis Cathedral to Pat O’ Briens on the River or the Riverview Room, right through the heart of the infamous French Quarter. Uptown venues are another great locations to have your own party through the streets. (Don’t worry, if your wedding is all in the same venue or not close enough to walk you can always include one at the end of the night! 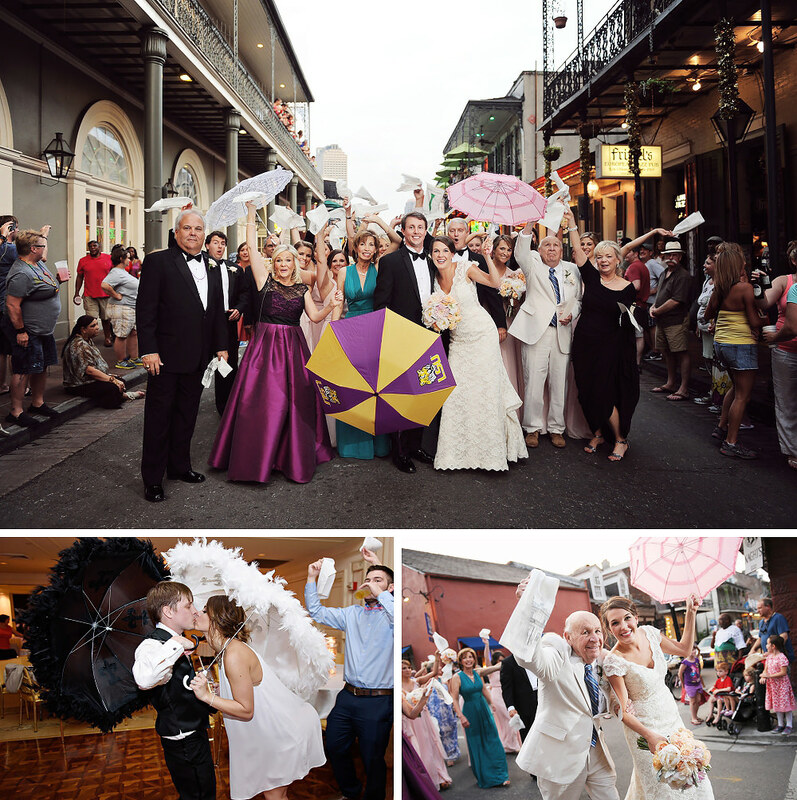 It is the perfect “send-off” idea to add to any New Orleans wedding! See more information on the best way to host an in-house second line below.) These parades also make for perfect photo opportunities! Personalized umbrellas for the bride and groom, hankeys, glow sticks or sunglasses are just a few of the props couples have included in their “parades”. We have even seen people toss beads! There are no strict guidelines you must follow, so creative props and ideas are highly encouraged to make this walking party unique to each group. 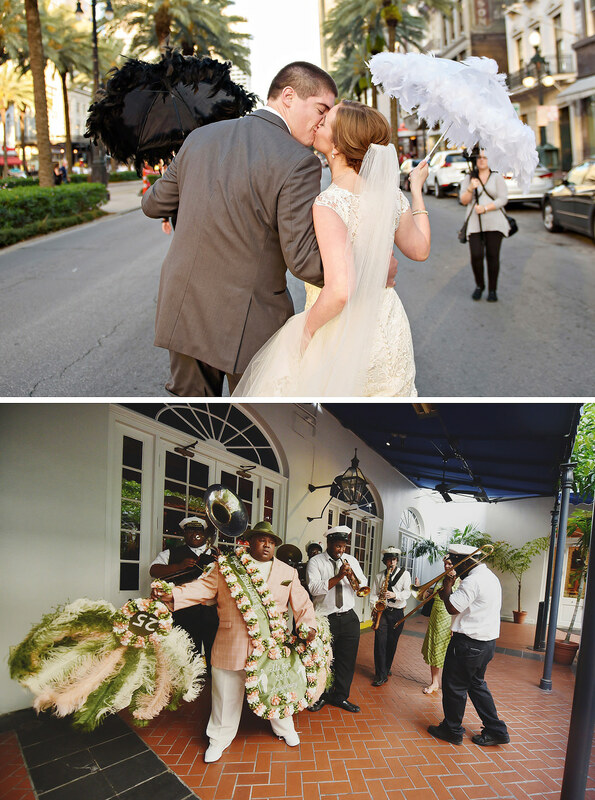 What better way to celebrate your big day and “laissez le bon temps rouler” than with live music and a parade in your honor!